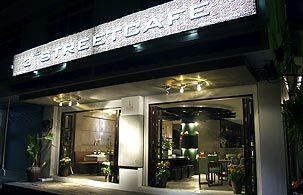 The 3 rd Street Cafe and Guesthouse proudly provides the latest trendy style cafe with the cozy atmosphere, the location of our idyllic cafe is at the heart of Kata beach (Kata Night Bazaar) and shortly 200 meters from Karon beach and of course, easily walk to shopping center, local shops and restaurants within minutes. With outstandingly stylish guesthouse and professional standard services, we proactively guarantee in every satisfaction. As 6 up-to-date guestrooms providing along with various amenities to make life easier and more pleasant. Every step at this trendy guesthouse, you will enjoy with blissfulness in the outdoor swimming pool, library and sitting area. Touching high standard and get value for money.